[Saturday, October 02, 2004] The Golden Palace.com Space Program Powered by the da Vinci Project announced today that it has received full authorization approval from the Canadian government to launch its manned flights to space. [Saturday, October 02, 2004] On Monday, 47 years to the day after the Russians launched the world’s first satellite Sputnik, Mojave Aerospace, a private space company, will attempt to win the Ansari X Prize ... and demonstrate to the world that America is still the leader in space. [Sunday, October 03, 2004] The X PRIZE has just received official notice from Burt Rutan that SpaceShipOne's second flight (X2) will take place Monday morning, October 4th. [Monday, October 04, 2004] This morning SpaceShipOne made its second flight in less than two weeks. The vehicle passed 100 km and, at a maximum altitude of 368,000 feet, passed an altitude record set by NASA's X-15 forty years ago. Today's flight was flown by pilot Brian Binnie. [Monday, October 04, 2004] On September 6, 2003, the NOAA N-Prime satellite fell to the Lockheed Martin Space Systems Company factory floor in Sunnyvale, CA. Technicians were working on the spacecraft, when the accident happened. The spacecraft suffered significant damage. 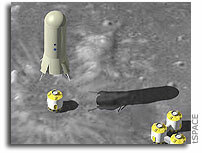 [Tuesday, October 05, 2004] MacDonald, Dettwiler and Associates Ltd. confirmed today that the Company has received authorization from NASA to proceed with preliminary work on a solution to rescue the Hubble Space Telescope. The authorization is valid for three months. [Wednesday, October 06, 2004] To celebrate the 50th anniversary of the launch of the first man-made satellite, Arianespace will launch a cluster of 50 nanosatellites for the International Astronautical Federation in 2007. 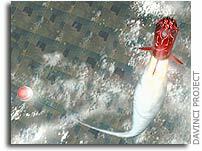 [Wednesday, October 06, 2004] Attendees can learn about space technology products that are improving life on Earth. The Space Certification Program is co-sponsor of the Exhibitor Lounge, which will feature information and displays of some of the program's leading partners. [Wednesday, October 06, 2004] NASA's determination states that its liability is limited to the contractually-stipulated $8.0 million contract provision. The Company is pursuing receipt of the $8.0 million plus interest from NASA in this fiscal quarter. [Wednesday, October 06, 2004] Space Exploration Technologies Corporation (SpaceX) has transferred the Falcon I flight vehicle to its launch complex at Vandenberg Air Force Base. The vehicle will now undergo a series of pre-launch tests. [Thursday, October 07, 2004] By a voice vote, the House of Representatives last night approved a resolution introduced by Rep. Dana Rohrabachercongratulating Mojave Aerospace Ventures for winning the X Prize and commending the X Prize Foundation for spurring this achievement. [Friday, October 08, 2004] The Sea Launch Independent Review Board (IRB) has concluded its review of the Telstar 18 mission on June 28, which released the satellite short of its intended target apogee. Sea Launch is now ready to return to flight. [Friday, October 08, 2004] LaRC is seeking partners from other government agencies, industry, academia, non-profit institutions, and FFRDCs to address technology advances in Descent and Terminal Guidance System Technology for Pinpoint Landing and Hazard Avoidance. [Friday, October 08, 2004] The House tonight passed, by unanimous consent, a bill (H.R. 5245) to extend the law under which the U.S. government insures companies that launch satellites for damages or deaths sustained by individuals who were not involved in the launch. [Saturday, October 09, 2004] NASA GSFC has recently initiated a Deep Space Laser Communication Earth Terminal Study under the sponsorship of the NASA Mission Offices for Space Operations (Code M) and Science (Code S). [Monday, October 11, 2004] The AMC-15 telecommunications satellite is ready for launch Oct. 15, 2004 from the Baikonur Cosmodrome aboard a Proton/Breeze M launch vehicle provided by International Launch Services, a Lockheed Martin joint venture. [Wednesday, October 13, 2004] Iridium Satellite LLC, provider of secure global satellite voice and data communications, announces that the U.S. Department of Defense has exercised an option on its airtime contract. [Wednesday, October 13, 2004] Business leaders interested in learning more about government contracting and what local and national vendors have to offer should attend the "Business Opportunities Expo 2004" on Oct. 19. [Wednesday, October 13, 2004] The Falcon I actual flight vehicle is now on the SpaceX launch pad at Vandenberg Air Force Base. This is a huge milestone for our company and is the result of a monumental effort by everyone here. [Wednesday, October 13, 2004] Integral Systems today announced a contract with PanAmSat Corporation to expand their existing EPOCH IPS satellite control system to take over operations of their two FS1300 satellites and for the operations of their SS/L FS1300 Omega bus satellite. [Thursday, October 14, 2004] Foresight Institute has appointed Dr. Peter Diamandis, Chairman of the X PRIZE Foundation, to lead the think tank's Nanotechnology Prize Steering Committee. [Friday, October 15, 2004] A Russian Proton launch vehicle placed the AMC-15 satellite into orbit this morning, marking the ninth mission of the year for International Launch Services (ILS). [Tuesday, October 19, 2004] NASA is moving The Vision for Space Exploration from concept to reality. Working with the best in the aerospace industry, NASA is already exploring and refining the concepts that will help America return to the Moon, to Mars, and beyond. [Wednesday, October 20, 2004] For Flight 164, the Ariane 5 ECA heavy-lift vehicle has been moved back to the final assembly building after completing a countdown validation test that included fueling the vehicle's ESC-A cryogenic upper stage. [Wednesday, October 20, 2004] On the eve of the Presidential election, Americans continue to support human space flight and endorse the Space Exploration plan to return to the Moon and to Mars, but they also question the relationship of NASA to its constituents. [Friday, October 22, 2004] Orbital Sciences Corporation announced today that it is in final preparations to launch NASA's Demonstration of Autonomous Rendezvous Technology (DART) spacecraft aboard a Pegasus rocket. [Sunday, October 24, 2004] The objective for this contract was to develop a low cost, highly operational alternative to turbo pumps for high performance propulsion systems. DARPA is the central research and development organization for the Department of Defense (DoD). [Sunday, October 24, 2004] A new launch vehicle is taking shape at the Spaceport in French Guiana as Flight 165's Ariane 5 G begins its buildup in the Launcher Integration Building. [Monday, October 25, 2004] The first spacecraft with an Ecliptic RocketCam video system on board is scheduled for launch around 11:15 a.m. PDT by a Pegasus XL winged rocket on October 26 (Tuesday) off the California coast near Vandenberg Air Force Base. [Tuesday, October 26, 2004] Lockheed Martin today reported 3rd quarter 2004 net earnings of $307 million ($0.69 per diluted share), compared to $217 million ($0.48 per diluted share) in 2003. Net sales were $8.4 billion, a 4% increase over third quarter 2003 sales of $8.1 billion. [Wednesday, October 27, 2004] Northrop Grumman Corporation reported that third quarter 2004 income from continuing operations rose 46 percent to $291 million, or $0.80 per diluted share, from $200 million, or $0.54 per diluted share, for the same period of 2003. [Thursday, October 28, 2004] NASA and Orbital Sciences Corp. have postponed today's launch of the Demonstration of Autonomous Rendezvous Technology (DART) spacecraft due to the discovery of particulate contamination found inside the fairing of the Pegasus launch vehicle.